UPDATED: Music Beta by Google service challenges Apple and Amazon | What Hi-Fi? More details have emerged of Google's Music Beta service at the company's developer conference. The service will be free for US users lucky enough to get an invite from Google. But, like Amazon, Google hasn't signed a license agreement with any of the major record labels so in effect Music Beta is essentially a massive remote hard drive. Without the support of record labels, users will not be able to share their Music Beta by Google tunes or purchase new songs, unlike on services such as Spotify. * Storage: Google allows for 20,000 songs to be uploaded into the cloud, a big increase from Amazon's 2,000 song/5GB limit for free accounts. * Movie rentals: films will be available to rent fom the Android Market app store, but initially only in the US. Users will be able to stream films live from Google, or temporarily download them to Android portable devices to watch them offline. * Uploading: Uploads will be handled by a small downloadable client available for both PC and Mac. You can upload your personal music collection to a single library, or add your iTunes library and all of your playlists. * Flash-Based web player: Music Beta by Google will have a flash-based web player that's integrated with Chrome OS. * Android only: Currently, Music Beta is destined only for Android-powered devices. It's optimised for Android 3.0 Honeycomb, but any Android device running version 2.2 or above can also use it. * Single view: Songs streaming from Music Beta will be seamlessly integrated with those contained on the device's hard drive, meaning Music Beta will not be a separate app. Google has also launched a new music app for Android devices which is available on Android Market. * Instant Mix: Functioning almost exactly like Apple's Genius playlist creator, Google's Instant Mix creates new playlists based on a single song by analysing the song's characteristics and matching them with other tunes you have. * Syncing: Playlists created in Music Beta by Google will appear on all players associated with that Google account, automatically syncing across desktops, tablets and smartphones alike. * Offline playback: The songs you've recently played will automatically be available offline. You can also select specific albums, artists and playlists you want to have available when you're not connected. * Sound quality: Streaming files can run as high as 320kbps depending on network connectivity and device support. Apple, meanwhile, is rumoured to be developing a streaming iTunes service to be integrated with an upcoming MobileMe revamp. We're expecting details of Google's new cloud-based music service to be unveiled later today at the company's developer conference in San Francisco. 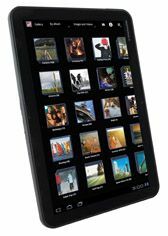 Called Music Beta by Google, the cloud-based music player will allow users to upload and store their music on the internet and listen to it on Android phones or tablets (such as the Motorola Xoom, above) and computers. A Google spokesman says: "We plan to announce Music Beta by Google at our Google I/O developer conference. Please tune in to Google I/O Live on Tuesday and Wednesday for more details on all the news." It is similar to a "digital music locker" service launched by Amazon, the Amazon Cloud Player, in March, and will rival Apple's iTunes by giving Android users an easy way to store and listen to their music collections. But Google, like Amazon, is not thought to have done any deals with major record labels, offering a streaming listening service rather than one in which users can share songs or download the files themselves. We'll bring you more info as soon as we get it.